Courtesy of John Dickinson, nephew of P/O Dickinson. A sketch by Norman MacKenzie. Click to load a larger version in a new window. An almost complete crew photograph taken by 'Jack' Ellenor. Only Sgt Hainsworth is missing. Left to right : 'Billy' Wale, 'Bob' Hudson, 'Jonny' Dickinson, 'Bill' Sizer and 'Mac' MacKenzie. Known as the "Bad Penny Crew". Mosquitoes of 627 Squadron, Woodhall Spa, used 5 Group's low-level marking technique for the first time. The attempt was not accurate and much of the bombing fell outside Schweinfurt. Meanwhile, German night fighters had managed to penetrate the 215 strong main force taking a heavy toll; 21 Lancasters failed to return. P/O John Dickinson and crew were lost. After surviving so many close calls in the earlier part of their tour, the 'reaper' finally got them on their 25th operation. 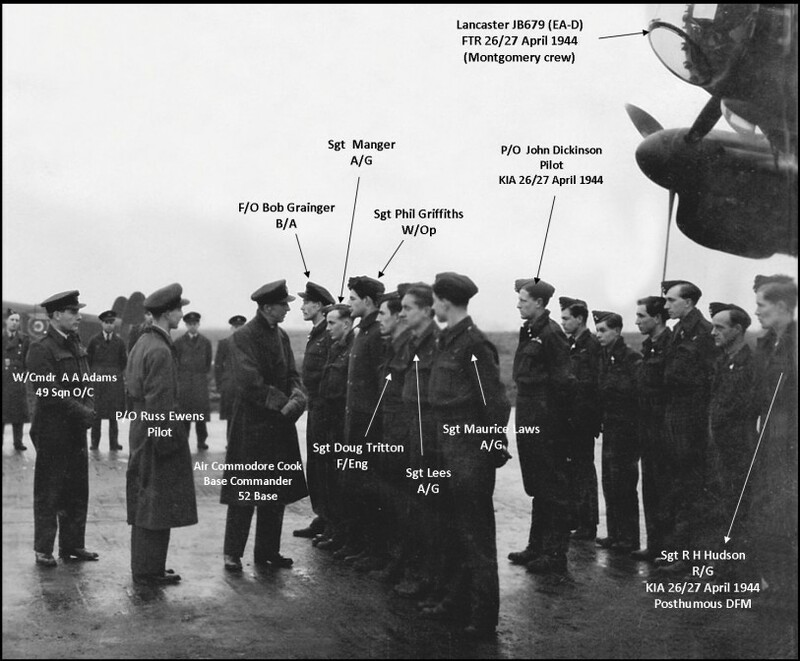 Many on the squadron thought that Johnny Dickinson and crew, (who loved flying their Lancaster at very low-level on training flights) had been blessed with that precious bomber crew commodity 'luck', and were sure that they would get through their tour. Seven white headstones in a neat line mark where all seven lie at peace in Ugny-sur-Meuse Cemetery, France. Hauptman Helmut Bergmann of 8 NJG4 shot down three Lancasters in 11 minutes. Interception was at an altitude of 12,000ft, near Ugny, 15kms SW of Toul. It would appear that he used 'Schrage Musik' cannon to despatch these aircraft. Click this link to view details of Hauptman Bergmann together with his combat report and English translation. This file, depending on your browser settings, may automatically download rather than open in a new window.